Visiting the tiny city of San Miguel de Allende is like taking a journey back to old, colonial Mexico at its most beautiful. This is one of those places where the light makes even more out of the postcard-perfect main plaza, the impressive main church, the cobbled streets and graceful architecture, and makes the place feel colourful, and possibly, if you've a romantic soul, quite magical. The best places to stay in San Miguel de Allende are ideally located to make this most of this gorgeous city. As well as gaining World Heritage status, San Miguel de Allende's beautiful centre draws people in, and there's a very cosmopolitan feel to the place - there's plenty of choice when it comes to the hotels in San Miguel de Allende, or places to eat. There are also frequent local fiestas and parades, lovely little boutiques and galleries displaying the work of some of Mexico's best artisans. Visit the majestic Parroquia de San Miguel Arcangel - described as being the city's most recognisable landmark, the pink church towers impressively with beautiful architecture inside and out. Relax and grab a bite to eat in El Jardin - a central square featuring numerous restaurants and shopping opportunities. Marvel at the artistic pieces in Galeria Atotonilco. The gallery holds a great selection of folk pieces with the guide being very knowledgable and informative. Enjoy the historic architecture at the Canada de la Virgen - an ancient pyramid only recently excavated with various artefacts. Stroll around El Charco del Ingenio - a botanical garden and nature preserve just outside the city. There's plenty to do here, from an interactive garden for children to workshops and concerts making it great for all the family. Our selection of the best places to stay in San Miguel de Allende include a wide range from luxurious escapes to central properties ideal for exploring everything this great city has to offer. The Hotel Matilda is a luxury chic hotel where style is key. Prestigious modern art adorns the walls and a plethora of opulent amenities are designed to cater for every whim of comfort-seeking guests. Spa, gym, swimming pool, quality restaurant and library are all on site, with a number of activities available off-site. L'Otel is a small (but perfectly formed) property whose individually designed suites feature soft hues, antique furniture, luxurious bathrooms and floor to ceiling windows. A rooftop pool and bar are the icing on this appealing cake. Fabulous. 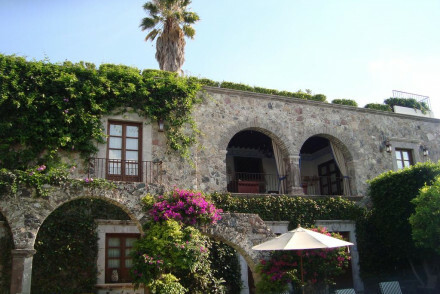 Hacienda El Santuario is an atmospheric property in the heart of San Miguel de Allende. Spacious rooms are traditional in style with white washed walls, fireplaces, enormous windows, four-poster beds and luxurious bathrooms. With easy access to the city's main attractions this makes for a tranquil and easy base. 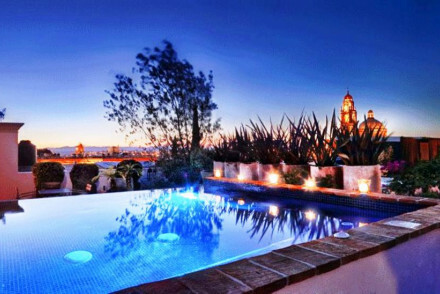 Unwind completely at Dos Casas Hotel & Spa - a chic boutique hotel boasting impressive city views. Atmospheric rooms feature exposed brick, beamed ceilings, crisp white linen and wonderfully contemporary bathrooms. A spoiling spa and fabulous restaurant makes this a winning choice. With opportunities for guests to participate in cooking classes, Belmond Casa de Sier is a spectacular property set in a 16th-century residence perfectly combining historic charm and contemporary style. Spacious suites feature chandeliers, ornate antique furniture and fireplaces. A tranquil garden and pool are ideal for unwinding and the restaurant serves exemplary regional cuisine. If you'd prefer a self-catering option this holiday, don't hesitate to visit our online partner, Booking.com for a great selection of properties perfect for exploring everything the city has to offer. Fly to Querétaro Intercontinental Airport situated 86km (53 miles) from San Miguel de Allende. The airport serves a good selection of both domestic and International destinations. It is also possible to get a bus from Querétaro to San Miguel de Allende. San Miguel de Allende is a year round destination but the best time to visit is probably between November and April when you'll find warm daily temperatures (although it can get cold at night) with less rainfall than other months. 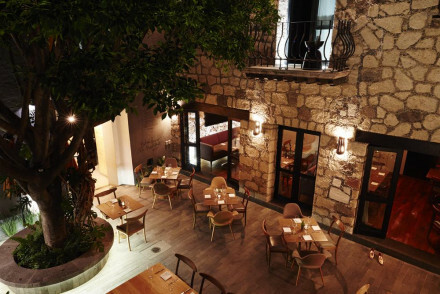 An atmospheric property in the heart of San Miguel de Allende. Spacious rooms are traditional in style with white washed walls, fireplaces, enormous windows, four-poster beds and luxurious bathrooms. With easy access to the city's main attractions this makes for a tranquil and easy base. 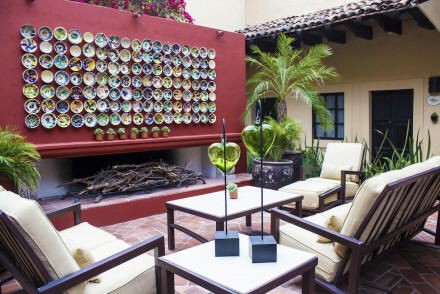 Local exploring - An authentic stay well located close to downtown San Miguel de Allende. Sights nearby - Visit the atmospheric Parish of San Miguel Arcángel. Local markets - Scour the Handicraft Market for local artefacts. A spectacular property set in a 16th-century residence perfectly combining historic charm and contemporary style. Spacious suites feature chandeliers, ornate antique furniture and fireplaces. A tranquil garden and pool are ideal for unwinding by and the restaurant serves exemplary regional cuisine. Local exploring - Well located to explore San Miguel de Allende's historical sights. Sights nearby - Take a walking tour and admire the town's beautiful architecture. Cooking classes - Learn the regions' secrets at the Sazón cooking school. Luxury chic hotel where style is key. Prestigious modern art adorns the walls and a plethora of opulent amenities are designed to cater for every whim of comfort-seeking guests. Spa, gym, swimming pool, quality restaurant and library all on site, with a number of activities available off-site. A chic boutique hotel boasting impressive city views. Atmospheric rooms feature exposed brick, beamed ceilings, crisp white linen and wonderfully contemporary bathrooms. A spoiling spa and fabulous restaurant makes this a winning choice. Local exploring - Just a short walk from the city centre and boasting spectacular views of San Miguel de Allende. Spa breaks - Be utterly pampered over a personalised therapy at the Dos Casas Spa. Local markets - Explore the Mercado de Artesanias for local handicrafts. Sights nearby - Visit the famed Parroquia de San Miguel Arcangel. A small (but perfectly formed) property located in picturesque San Miguel de Allende. 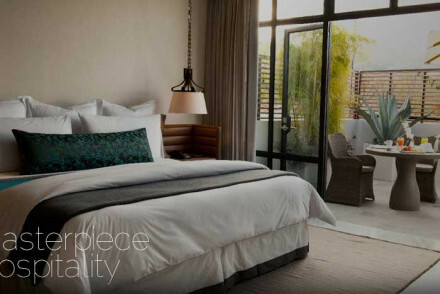 Individually designed suites feature soft hues, antique furniture, luxurious bathrooms and floor to ceiling windows. A rooftop pool and bar are the icing on this appealing cake. Fabulous. Hideaway - A tranquil property with just 4 suites. A real home away from home but with some serious luxury too. Local exploring - Ideally located for easy access to the town's major attractions. Sights nearby - Visit the town's central square and marvel at the impressive La Parroquia church. Cooking classes - Take a cooking class with either Sazon or Petit Four.